I'd go for a button down Wacky shirt like that. The more I look at the Creepy Co website, the more excited I get for possible cool Wacky items. They have a ton of GPK items I'd spring for in a heartbeat. As long as Topps isn't doing anything to get me excited about Wackys, I guess I need to count on outside companies to keep the fire going. I just sent a message to Creepy with some thoughts. Perhaps it would help encourage them to hear from more Wacky folks. I'm a long time Wacky Packages collector and was thrilled to hear you would be creating some Wacky items! To be honest, however, while I like the first three (I hope there's more) Wacky items you've conjured up, I don't know that I'll actually be ordering any. I appreciate your note about how you're the "company you keep", so I thought I'd give some feedback on what I would love to see as a Wacky Package collector. First, though, here's why I'm not immediately sold on the three Wacky items you have so far. The t-shirts are indeed cool, but many companies have released Wacky t-shirts. I personally have dozens (in fact, I recently listed 17 to sell on ebay). Your designs are great, but in the end, it's still a t-shirt which leaves me on the fence. (For what it's worth, I can also be a bit wonky about buying clothes online as I am not confident how they'll fit). I love the idea of the pins and would be more inclined to purchase those. However, my slight disappointment is in the selection of images/titles you used. We long-time Wacky collectors (who bought them as kids in the 70s) have a huge fondness for the "original series" titles that came out back then. Norm Saunders, the artist who painted most of them, is a master and there would be so many monstrous images from which you could choose. I'd happily give you some suggestions if you'd like, but I know I would strongly prefer to focus on those rather than a sampling from the different eras of Wacky Packages. 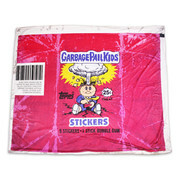 In perusing your website, I saw lots of really cool Garbage Pail Kids items! I'm not a GPK collector, but I would love to see some of the GPK items you made done as Wacky Packages. Some of the ones that most stand out to me are the wax wrapper blanket, patch, plastic cups (though a pint glass would be similarly awesome), buttons, puffy stickers, zipper pulls, and pin set (amazing!). I also like the cushion and socks, though to a lesser extent. And while I know I previously said I'm a bit reluctant to buy more t-shirts, I do like many of the GPK shirts that AREN'T t-shirts, such as the polo and button-up shirt. Again, I'm very pleased to hear that you are delving in the Wacky world! Your company sounds fun and I see a good deal of potential to create some incredible Wacky items. I wish you well and will keep my eyes peeled on your website. Nice email. I hope they take it to heart and create some items we can buy. Thanks for your efforts. Nice with the email. I hope they actually pay attention to it. I follow Creepy Co. on Instagram. Here's an exchange on their post of the FANG Shirt. I dig the items you listed but was wondering if this will be an ongoing thing with new shirts released over time. Don’t take this the wrong way but with so many classic Wacky Packages I was kind of disappointed that there was just two shirts.....now I will go buy them. Perhaps you could tell them that response might be low, not because of lack of interest in Wackys and Wacky products like shirts, but because of the simplified art, not to mention the price? If they were really well rendered, I could go for the price. Those are certainly good points. For me, it was price and just the fact that it was a t-shirt (of which I already have so many). It is curious about the simplified art, however. I am torn as to whether to support the cause and pay $35 or $40 for another t-shirt when I already have so many and just hoping they come out with other non-t-shirt items. I would happily load up on many of the other items they created with GPK images. Thanks for the input and feedback. We're just "testing the waters" with this Wacky Pack launch. Our GPK line also started out small and expanded to what it is today. If the interest is there the same could happen. It's also a Topps property license so we're still beholden to what they approve. If the interest is there the same could happen. Yes, that's exactly what I'm afraid of. Same thing with Topps. They release combo WP/GPK sets and then wonder why they don't sell. Or release amateurish sets with lousy inserts and sales dip. I guess the only upside is that I'm saving money, but I would happily give it to any company that produces quality Wacky items at a reasonable (and sometimes not even reasonable) price. I won't be spending money on iffy shirts to possibly cause cool ones to made. They are having a 20% off sale. Still pricey but a little better. 25% off through tonight, for those still thinking about these items. Looks like it's around a 30% off sale at Creepy Co. I'm no marketing guru, but I'd think you'd want a photo of the entire blanket somewhere on the page. The photo I added above of the whole blanket is on the page but its a display that changes pics every few seconds. Seems like if you aren't on the correct portion of the page with your cursor, it doesn't always change the picture. "the throw comes complete with fold grunge"
I think I emailed them asking about producing more Wacky items. They have some awesome GPK stuff and I believe the only Wacky item was the three enamel pins (which I did buy when they had a sale). A wacky blanket would be fabulous! Fang and Cult 45 shirts, too.